TORONTO, ONTARIO (October 7, 2013) – Pangolin Diamonds Corp. (TSX-V: PAN), (the “Company” or “Pangolin”) is pleased to announce that diamond core drilling has commenced at its 100% owned Jwaneng South Project (the “Project”) in Botswana, Africa. This is one of Pangolin’s four 100% owned diamond exploration projects in Botswana. Drilling marks the next major step in Pangolin’s exploration of its Jwaneng South Project. The Company has identified more than 20 drill-ready kimberlite targets at the Project area since work commenced in 2011. 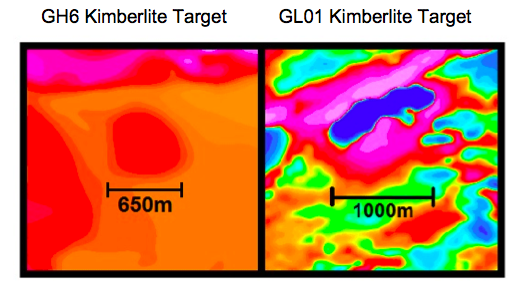 Gravity lows at GK6 are the same to those associated with the Jwaneng Mine diamondiferous kimberlites. Pangolin’s diamond drill program at GK6, now underway, will consist of at least two core drill holes to a minimum depth of 150 meters. The drilling will center on two magnetic phases identified within the aeromagnetic anomaly associated with the feature visible on Google EarthTM. A number of other aeromagnetic and vegetation (geo-botanical) anomalies within the Jwaneng South Project are targeted for drilling during this campaign. They also exhibit magnetic positive or negative characteristics. The Jwaneng Kimberlite field has 18 confirmed kimberlites, of which at least 6 are known to be diamondiferous and 4 are being mined. This represents a 1 in 5 conversion from exploration target to production. The field is situated in the Southern District of Botswana, 100 km north of the South African border. The Jwaneng Mine is the world’s richest diamond mine by value, contributing 60% – 70% of Debswana’s annual revenue. It generates approximately US$1.16 billion from 8 million carats produced annually. The 799 km2 Jwaneng South Project is located 50 km south of the Jwaneng Mine. The Jwaneng Mine was discovered in 1972 and is operated by Debswana, a joint- venture company between DeBeers and Botswana. There is well-established infrastructure in the area with a skilled workforce, roads, power and water. Pangolin has identified more than 20 large, drill-ready kimberlite targets at its Jwaneng South Project through exploration work completed since 2011. 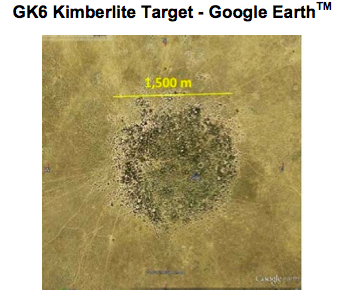 The Project has multiple, circular crater-like features with aeromagnetic characteristics similar to those of kimberlites in the Pipe 441 area of Canada. Enzyme-leach trace element results are consistent with orientation trace element results over known diamondiferous kimberlites from the Jwaneng kimberlite field. These results come from an independent analysis of samples by Activation Laboratories Ltd. of Ancaster, Ontario. Company, and there is no guarantee that the kimberlite targets being drilled by the Company will return diamond results of any economic significance. Pangolin Diamonds Corp. is building a leading diamond exploration and development company in the heart of Botswana, the world’s leading diamond producing country by value. The Company is the 100% owner of 11 Prospecting Licences covering 5,307 km2, including the Tsabong North, Jwaneng South, Malatswae and Mmadinare Projects. Pangolin’s management and team leaders have over 135 years of combined diamond exploration experience in southern Africa. This makes the Company the most experienced diamond explorer in Botswana other than DeBeers Exploration and Debswana. The Company is equipped for exploration, with two diamond drill rigs and a fully portable one-tonne per hour Dense Media Separation Plant used to prepare samples and make diamond concentrates. Pangolin is well-funded to continue its exploration programs into 2014. The technical disclosure in this news release has been reviewed and approved by Dr. Leon Daniels, Ph.D., Member of AIG, Chairman of the Board of Pangolin, and a Qualified Person under National Instrument 43-101 rules.